On Tuesday evening, the San Diego Unified School District joined the San Francisco Board of Supervisors and the Oakland and Richmond City Councils in passing a resolution in support of Commercial Property Tax Fairness. The resolution is an endorsement of California Senate Constitutional Amendment 5 (SCA 5), legislation introduced by State Senators Holly Mitchell and Loni Hancock to fix a structural flaw in Proposition 13 that has allowed some wealthy corporations and commercial property owners to dramatically lower their tax bills by avoiding reassessment. These municipalities are leading the way towards correcting underlying inequities in Prop. 13. Residential property owners in California are increasingly paying a greater share of total property taxes while a minority of commercial property owners benefit from a flaw in the bill that has allowed their properties to avoid reassessment, some of them since the 1970s. SCA 5 seeks to correct the imbalance. It would make California’s property tax code fair by assessing commercial properties at their market value after a phase-in period. 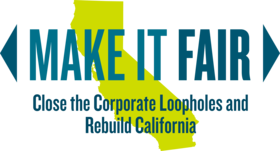 The USC Program for Environmental and Regional Equity estimates that fixing the flaw would generate $9 billion in additional revenue for public schools, public safety, and improvements to critical infrastructure and quality of life projects starting in 2019. Under SCA 5, California’s property tax rates will remain unchanged and below the national average. California’s largest cities have property tax rates far below other major U.S. cities, making California a strong competitor for business. Filipino Advocates for Justice released this awesome video for the Make It Fair campaign. Check it out!